George Gallup Jr., the son of Gallup Poll founder George Gallup died of liver cancer last week at the age of 81. 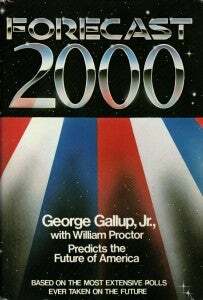 Gallup Jr. wrote a book with William Proctor in 1984 titled Forecast 2000 that contained numerous predictions about the future of the United States. Gallup Jr., coming from a tradition of opinion polls, naturally hoped that there might be a methodical and scientific way to forecast future events. "In this book, my goal has been to minimize as far as possible idle speculation about the future and to substitute what I believe constitutes the most reliable and comprehensive predictive approach now available." The first chapter of the book focuses on war and terrorism. Gallup Jr. sets a scene in New York City in 1997 wherein terrorists — armed with a nuclear device — storm the Empire State Building's observation deck. It's interesting to see a scenario focused on nuclear terrorism which, in 1980, was a threat not often discussed by mainstream media outlets. As we saw with the "panic-proof test" in a 1953 issue of Collier's, New York is a popular target of fictional destruction. But why New York? Max Page notes in his book The City's End: Two Centuries of Fantasies, Fears and Premonitions of New York's Destruction, "To destroy New York is to strike symbolically at the heart of the United States. No city has been more often destroyed on paper, film, or canvas than New York's." It's a warm, sunny spring afternoon. Office workers are just cleaning up cups and papers from their lunches in Central Park, Bryant Park, and other favorite outdoor spots. But then the unusual big-city tranquility is shattered by news reports that begin to come through on portable radios scattered around the grassy patches. A terrorist group of some sort has take over the observation deck on top of the Empire State Building. The terrorists claim they have set up and armed a nuclear device. It's quite a big bomb, they say — more powerful than those dropped on Hiroshima and Nagaski. As pedestrians gather in steadily growing clusters around the available radios, more information pours in: The terrorists are connected with some extreme anti-Israel faction. They have chosen New York City as their target because it has a larger Jewish population than any other city in the world — and also because much Zionist activity is centered there. The demands go on and on, and they're topped off by a seemingly impossible deadline: The requirements must all be met by high noon the following day. Otherwise, the device will be exploded, and all of Manhattan Island and much of the surrounding area will be seared to the ground. Moreover, radiation will make the land for hundreds of miles around the explosion site uninhabitable indefinitely. As the news of this threat spreads around the city, the reactions are varied. Most people stand or sit around just listening to the news. Some think the whole thing must be another Orson Welles joke — a phony broadcast designed to simulate reality. After all, there have been many other such dramatic programs in the past, and this is certainly just another to draw in a wide listening audience. Others accept it as a real event, but they're sure the terrorists are bluffing about the bomb. Still others are optimistic for other reasons: For example, they're certain that one of the government's antiterrorist teams will either overpower the offenders or negotiate a settlement of some sort. A number of people are too stunned to move. A few panic, and either break down in tears or start running to their apartments to gather their valuables together with the idea of getting out of the city. As the day wears on and night falls on the city, it becomes apparent that the broadcasts are no joke. Growing numbers of people — many more than the commuter lines to upstate New York and New Jersey can handle — try to get out of the city. Huge traffic jams build up, and there seem to be an unusual number of auto breakdowns and flat tires — more terrorist activity? people wonder. As the night wears on, the terrorists hold firm to their demands, and the sense of panic rises. What if they're serious? What if they really plan to explode that bomb? Increasing numbers of usually relaxed citizens begin to decide that perhaps they'd better waste no more time getting out of the city. But many don't have cars — a necessity in most cities, but not in Manhattan because of the extensive public transportation system. And those who do have cars find they can't even get close to the tunnels and bridges that lead out of the city. The one exception is Long Island — but who wants to get stuck out there if a nuclear bomb goes off in Manhattan? Daybreak reveals many strained, haggard faces on the city sidewalks and in the jammed-up autos on New York City thoroughfares. There seems to be no escape from this dilemma. One attempt to overpower the terrorists has failed, with several attack helicopters shot down. Finally, high noon arrives. New Yorkers sit glued to their radios and TV sets, waiting with bated breath. The negotiations have broken off, but there's still hope that the terrorists will make some sort of counteroffer. That's the way this sort of game is played, and most people believe there has to be a solution. After all, what's the point in a bunch of terrorists blowing up an entire city when they're in a position to get something, even if it's not everything they asked for? The lull continues through four minutes after twelve, then five minutes. A growing number of listeners and viewers begin to relax. Something good must be happening. Then, the blinding light flashes into every dim corner of the city, and the roar follows almost simultaneously. But no one has heard the roar because the searing heat has destroyed all life.